Typical Maya pyramid one would say. Wrong! 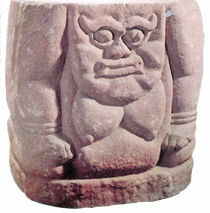 Very similar to the Pakal (Maya) face. In reality, Chinese, though. 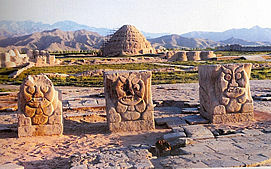 The story starts in a wide basin north of the Kunlun mountains in Western China. At that time it was very fertile. Nowadays it is one of the biggest deserts on earth. Chinese say that "proto-humans" lived there e.g. people from before the patriarchal era. 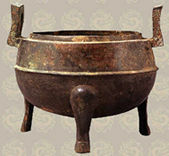 It is linked to the "magical" Western Kingdom, with its Queen Xiwangmu, (much) later giving rise to Taoism. 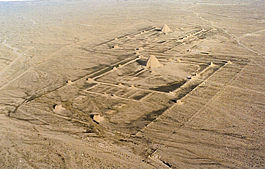 From here - probably after the "Big Flood" people started to move to the East, the South (Mesopotamia! and viceversa) and the West. One North-Eastern route (Xia-people) to Inner Mongolia, one to the South (Yin people) to Huabei in the heartland of China. They had two main characteristics: worship of the Great Mother (NuWa) with Her Son/Lover (Priest/King) and their abilities to study the stars. Not surprisingly thus, that both groups built pyramids. In the mean time, Northern tribes had already found their way to the East as well, probably attracted by the Pacific warm current. In total at least 25 waves of migration found their way over the Bering Street, the Aloetes, Korea, Japan and also probably further south (Philippines) to the America's. In the course of time they inhabited the whole continent from the North (Irokese)* to the very South (Inka's). An increasing number of facts are found nowadays, that prove the Chinese origin of American Indians. Including a.o. 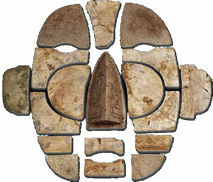 Olmecs, Toltecs, Aztecs and Maya's. The latter got their name from the Chinese "Moya" which means "those who polish their teeth". The Olmecs language originates from the Chinese province of Shandong....At La Venta (Mexico) countless black jade objects have been found...with Chinese characters on them. Palaces in both China and MesoAmerica were painted red, both say it is the color of power. 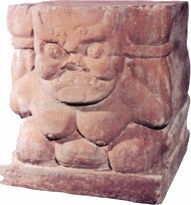 But most and foremost the cosmology - the Original Cosmic Mother with Her Son/God (the Maya Green Priest/Kings e.g. 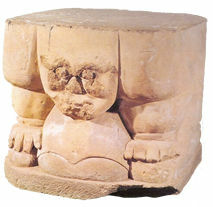 Pakal)- is the striking feature that is connecting Asia with native America. * In Irokese society (currently state New York, USA) the elderly women (grandmothers) were the head of the house and the clan. They even could "fire" a (male) chief. In fact, (Latin) American indigenous people`s have been proto!Chinese Mother-oriented people fleeing for rising male-dominated Asian warrior tribes*. That means both Chinese and Maya f.i. come from the same ancient root. Typically, the first Chinese emperor (Qin) destroyed all sacred documents of the Yin and other matrifocal people, while forbidding to exercise their astrology....In the America's, on the other hand, they were (relatively) safe, and could continue their original heritage. This is the most fascinating fact of all. Reason not only to cherishing them, but also supporting them to survive, e.g. helping them to make a new step in evolution. The Maya's themselves have taken the lead with their fascinating prophecy of the End-Date in 2012, after which a New Era will emerge....** Let's celebrate it together with them! * Other groups of "original people" fled to the South. They are the "Chinese Minorities". Other South-East Asian peoples (Cambodians, Dayaks) might also have been emigrated, due to the same population pressure. It means, that American Indians and Chinese Minorities once lived as neighbors. **See. 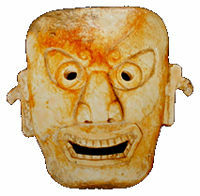 : "Maya Calendar End-Date Event"